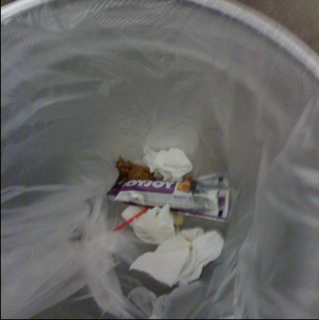 That is a Soyjoy bar in my trash. My mom bought it out of morbid curiosity I guess, after I told her my friend said they were gross. I really had no idea HOW gross she meant...until now. I'm not one to shy away from most foods. This one, I literally had to spit out. Gross! Just gross. I had to chase it with almonds and coffee just to get the taste out of my mouth. Tell me--Where is the joy in that?